Noted and thoroughly read. Jane Mayer was on CBC TV last night, I sure admire her courage for writing this book!Have no idea how these brothers can be brought down, but somehow it needs to be done. Surely there are still enough journalists and politicians that can't be bought off - well Bernie Sanders sure can't be and then there is Mr. Trumpetier, who I gather has a billion of his own. I related a comment quite awhile ago of all their holdings of land in the Tar Sands and Haristy, of Alberta, Canada. Somehow the oil is still getting through via the Alberta Clipper pipeline, which wants some expansion. We are not suffering all the job losses here for nothing, as we believe in climate change. Thank you for sharing, Cal. NONE of this should surprise ANYONE! These brothers were born in hell.....they are beyond awful. It was painful to read how deeply they have permeated American politics. With their involvement in ALEC, FreedomWorks, Americans for Prosperity, DonorsTrust, the Cato Institute, and their State Policy Network (which wasn't mentioned here, but dictates to every single state legislature), they practically own America. I keep hoping they'll go hunting in TX. Forgot to say that these brothers, and other like them, need to be highly taxed....along with all their various corporations. Noted, Just deplorable. Tax the hell out of them like all other large corporations Thank you for caring and sharing, Cal. Thanks, Cal, I will be buying that book. There are few real journalists these days because the newspapers and tv stations are corporate owned and controlled. We hear the news they want us to hear. The Koch Brothers and their ilk are really who control our country. The brother rats, all super-rich, corporate business and their ilk all have "yuge" options as to how to spend their billions and trillions, and they opt to spend it on the final touches of gaining total control over the masses, instead of pouring it into cleaning-up all of their climatic messes and repairing all critical issues in re environment, climate change and the so many horrendous plights of mankind. We know their mothers taught them not to mess where they eat, so it is purposeful and their target victims are the general masses. They are wrapped in safety and have future plans for Earth, survival, what's left of the resources, repair and healing of Earth or having to refine the means of leaving it---and those plans do not include us. They feel that overpopulation and the problems stemming from it, has to end. It will be rather quick and painful. The "yugest" issue is drinking water. So, learn wilderness survival techniques and use your spare time trying to prepare for the worst of times---which most are getting a taste of, in our tainted, poisoned, polluted, air, water, food, media,. Thanks Cal. Indeed throw some more light onto these Kochroaches. All our Institutional pillars that were suppose to protect us, the common people, or as Hillary would call us, the "little people" have broken down and have sold out to the Oligarchy. Bernie Sanders is doing his best, with many people like myself backing him, but we are going up against a well oiled machine, and the press, has also been corrupted. It doesn't take a genius to see this fact if the people are paying any attention at all to what is going on out there. When the media fails us we are into it deep. You don't often get someone like Melissa Harris Perry that will take a brave stand as she recently did on MSNBC. The so called only progressive mainstream TV channel we had, now bought into by the Right and one by one has removed all the Progressive anchors like Keith Olbermann, like Ed Schultz. Story below on Melissa. And for those who would like to read the lovely speech that Hillary Clinton gave to Goldman Sachs calling us the "little people" and praising the Oligarchy one can read it here. 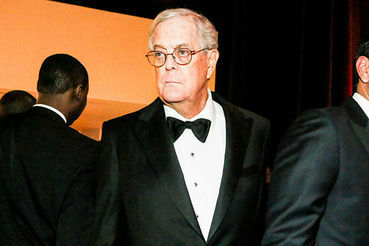 As many already said this is not surprising at all, but the way things stand in America at the moment it is an act of courage by Jane Mayer to expose the Kochs so openly. Kudos to her. You can't tax these bastards, because their frigging God-on Earth, St. Reagan changed the tax codes!! !